The news spurred Congress to hold hearings on the issue last week, where talk of creating a tenant bill of rights for military families has gained traction. Health News Florida's Stephanie Colombini spoke with Howard Altman with the Tampa Bay Times. He's been reporting on housing problems at MacDill Air Force Base and talks about how it can affect families. Listen to the conversation about health hazards at MacDill AFB and other military bases, and how national leaders are hoping to change that. Read a transcript of an extended version of this interview. It has been edited lightly for clarity. The need for good-quality housing is an issue a lot of people can relate to and is a problem both in and out of the military. And there’s a growing body of research that suggests housing and health are really intertwined, so for members of the military who need to be in top shape to serve, how can this housing situation affect that? If you’re downrange in a dangerous situation in Afghanistan, or you’re patrolling Syria or Iraq or someplace else, you’ve got to be at the top of your game mentally and physically. And then you get a call from your spouse at home that the kids are sick and coughing, there are mushrooms growing in the living room or there’s mold in the air conditioning system--you’re not concentrating on the job at hand – a very dangerous and deadly job. You’re thinking about your home. And that’s a big readiness issue. MacDill doesn’t actually operate the housing on base, a private company called Harbor Bay at MacDill is in charge of housing, and apparently that’s common. Ninety-nine percent of military housing is privatized. Talk more about that issue and how it makes holding them accountable more challenging. Back in the mid-1990’s the Pentagon took a look at the condition of its housing on bases around the country and found that it was in deplorable condition. And they found that it was going to cost about $20 billion and several decades to fix. So they decided to turn to private industry, people who specialize in building houses. It was a good idea at the time, but what has happened is because these are private companies, the military has no direct control over them. It leaves military families who are on base without many of the recourses civilians have, or even that military families who live off-base have. For instance they can’t withhold their rent and there’s no independent third party to go to for help. A lot of families have found that they’re living in unsafe conditions, and it’s so unsafe they decide to move, yet they’re penalized sometimes as much as two months’ rent. So they have to pay thousands of dollars in addition to finding a new place to live and that’s proven very onerous for a lot of people. MacDill Air Force Base is in South Tampa. What are families’ options in terms of living outside of MacDill? South Tampa is a very popular place to live and it’s a very expensive place to live. What military families get for housing, it’s called a Basic Allowance for Housing, doesn’t cover the rent a lot of times, so families choose to live on base. And MacDill Air Force Base really is a beautiful base. There’s about seven miles of shoreline, two golf courses, there’s a very good elementary school, Tinker Elementary, so there’s a lot of nice reasons to live on base. But there’s also a problem with some of the base housing. Did you find this was a widespread issue across the base or just a few units in bad shape? There are 527 homes on base managed by Harbor Bay at MacDill, which is a subsidiary of the Michaels Organization. I found at least 16 instances of people complaining but I believe it (the number of those affected) to be much, much more. I’ve seen on internal social media on the base that people are complaining, and a lot of people are afraid to come forward. Most of the families I spoke with wanted to only use the spouse’s name. There were two cases where service members came forward with their names and they were both Senior Enlisted Leaders at MacDill, the highest-ranking non-commissioned officers. I think that made a big difference because the command and people take a look at that and say, "Well these folks are coming forward, maybe I should,” and I think that there is going to be more to come. How has MacDill responded to this? Well, they have limited options. Because this is privately-managed housing, there’s not much that can be done. The base has reached out to folks, the commander Col. Steve Snelson of the Air Force has asked people to come forward and told them not to be afraid, that repercussions won’t be there. The major thing that the Air Force or other services can do is withhold what’s called a performance incentive bonus. It’s money that is built into these contracts to ensure that the contracts are complied with. If the performance is not there, they (military leaders) withhold a portion of that, and that’s the only stick, really, that they can use. In the case of Harbor Bay at MacDill, last year they did (MacDill officials) withhold some of that – how much, we don’t know. They won’t tell us, they say it’s in the hands of private companies and not available by the Freedom of Information Act. And it’s not just MacDill, we’ve seen reports come out from families in Texas coming forward, North Carolina, all over the country. And Congress has gotten involved. How did this explode into a national issue after years of people being afraid to come forward? Reuters did a great series of stories last year that exposed a lot of the problems around the country and that forced Congress to act as a result. And that’s often what happens, when the media shines light on a problem, Congress reacted (in January) and called for this hearing (the Feb. 13 Senate Armed Services Committee hearing). 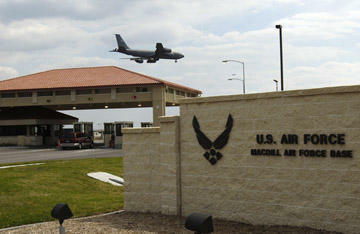 And after the hearing was called and set up, that’s when I found out about the problem at MacDill. So Michaels wasn’t called on the carpet at that point, but there were the families from here (MacDill) that were able to tell members of Congress what was going on. It was interesting at the Senate Armed Services Committee hearing last week, they talked about the possibility of having something along the lines of a tenant bill of rights. What that would do is give tenants the ability to withhold payments and have disputes adjudicated by a third party. But also, Assistant Secretary of the Air Force John Henderson, who is in charge of bases and facility management, talked about how he would like to see that the entire performance bonus be withheld in cases where it’s really bad. He says that would be a bigger hammer to use. When I talked to Michaels officials they said there are so many different components of those performance bonuses that it would be difficult to withhold the whole thing. We’ll see what happens, I think that there is certainly more action. You saw the Senate Armed Services Committee had a hearing, the next day a House Armed Services Committee subcommittee had a meeting. There’s two local Congressmen, U.S. Reps. Gus Bilirakis and Vern Buchanan, who have launched congressional inquiries into the problem. U.S. Rep. Kathy Castor has sent her people to look into it. There’s more attention to it and as we publish more stories hopefully we’ll continue to shine a light on a problem that needs that.